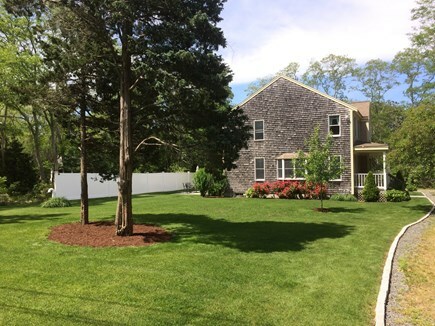 Light, bright and open to summer breezes; low traffic, wooded surroundings; safe for children, biking, walking, yet convenient to Eastham's many advantages. Our well maintained, newer, expanded-Cape home will help you to create the summer vacation that you cherish. 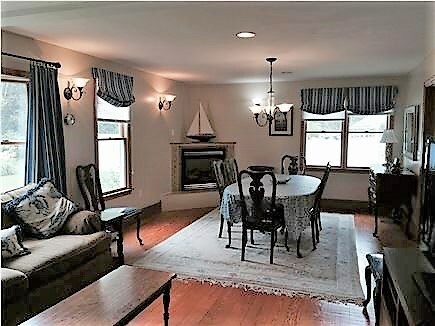 There is a large living room/dining room with a 46'' flat screen TV and blu-ray dvd player, and Bose IPOD docking station. Open kitchen and family room, and a first floor den/TV room (with a futon), as well as a large, private back yard with a patio for dining or relaxing, and an outdoor shower. 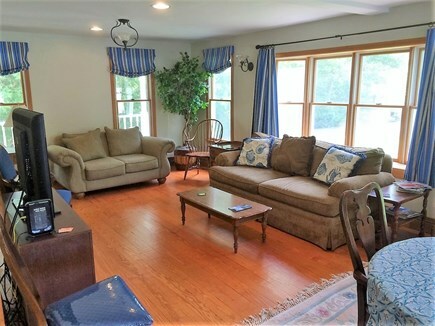 This spacious 3 bedroom 3 full bath home features central air, a gourmet kitchen with granite countertops, a gas fireplace, 2 living areas, a master suite with a large jacuzzi tub in the master bathroom, and 2 large guest bedrooms. All bedrooms are on the 2nd floor. The 2 large guest bedrooms share a bath. The laundry facilities are on the first floor. Off the breakfast area are French doors leading to a bluestone patio, with outdoor furniture, table, chairs, umbrella and a hammock. 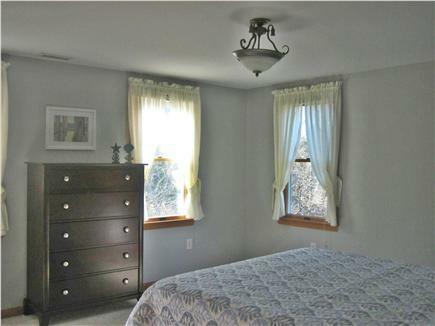 There is plenty of parking and the house sits back off the road for quiet enjoyment and privacy. Accommodations: 3 bedrooms and 3 full baths; in addition, a futon is located in the den, along with an additional television. Modern kitchen with granite counters combine with a family room that is complete with a gas fireplace. 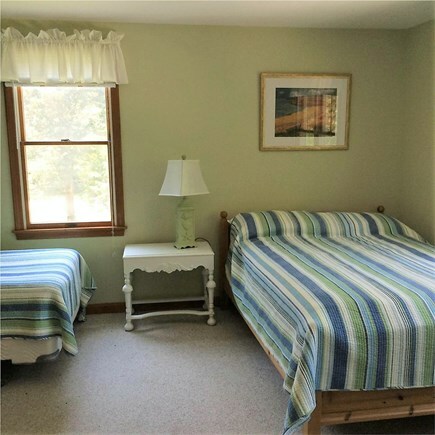 Easy bike ride to Rail Trail (sidewalks), minutes to bay & ocean beaches, the National Seashore Visitors Center, the Wellfleet Drive-In Theater, and many more attractions. Additional availability info: Weeks in September/October may have flexibility on move in day. This is a Saturday to Saturday vacation rental. This house is one of the nicest rentals I have ever stayed in. It has everything you might possibly need to make your stay feel like home. 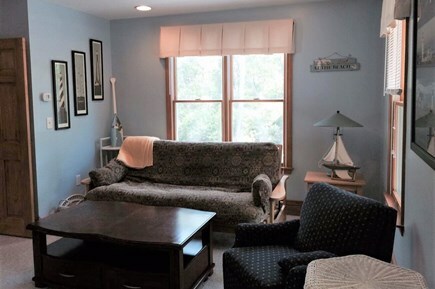 The house itself is spotless, spacious and in close proximity to all beaches and restaurants in Eastham. If you are looking to stay in Eastham- this is your house! We have been vacationing in the Cape since I was a child. Now I bring my children, and we have stayed at multiple different homes throughout the Cape. Rick and Susan made us feel like family! We have found our forever summer rental home. Close to the beaches, entertainment, shopping, but quiet and peaceful. I'm so glad we found this summer home! We absolutely loved this house! We stayed here with our grown sons and some friends. There was plenty of room for all. The floor plan is excellent. The kitchen is very user friendly. Having the laundry on the first floor is very convenient. The house was very clean. The house is in a nice private location. The grounds are well manicured and beautiful. We have been coming up to the Cape every summer for over 20 years and this is by far our favorite house. Thank you for your wonderful review. We hope to see you again this summer! The reviews for this house are spot on. You will not be disappointed if you rent this house. My family and I have stay here for 2 years and have throughly enjoyed ourselves. Everything about this house makes your vacation so much more gratifying from the outside shower, to the first floor laundry, to the roominess of the whole house. 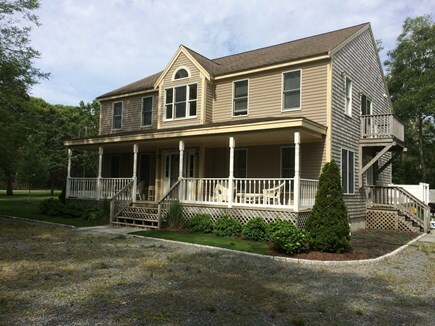 The owners, Rick & Susan, have done an excellent job of providing all that you need to have a carefree, relaxing vacation on the Cape. Another wonderful stay. We await the 2015 season to make our 3rd reservation. Everything from the veranda, the four showers, the abundance of space and board games, to the well equipped kitchen and family of bunnies make it such an easy and perfect stay. Enough cannot be said about the owners, Rick and Susan. They are quick to answer calls, emails, or texts. Plan your stay here, you will not be disappointed. Thanks for the wonderful review. Look forward to seeing you next summer. We are 2 time guests at this house, my family and kids love it. It's in a great location, has easy access to everything, and is located on a quiet dead end road off the main road. Owners have done a beautiful upgrade to the landscape and patio areas. House is always very clean, nicely kept and decorated. I would absolutely recommend this location to friends. The property is just a few hundred yards off Rt. 6, but on a quiet lane, at the north end of Eastham. 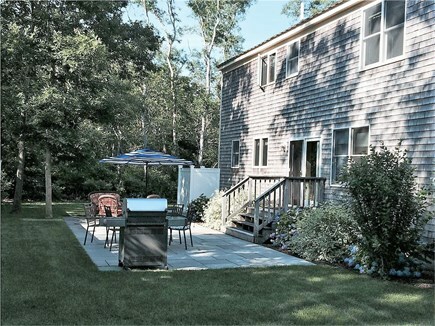 The location is great for easy access to both Eastham and Wellfleet beaches, as well as the Audubon Sanctuary. Both the interior and exterior are well-appointed, well-maintained and clean. It was our second stay at the house and we plan to return again next year! We loved staying at this house. We have vacationed in Eastham for the last 18 years, and this was by far the best house we've rented. We plan to rent this house again next summer, maybe even for two weeks! 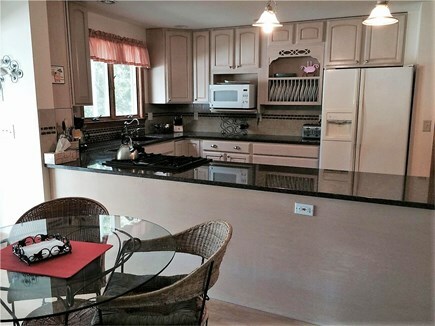 Nice touches like the Bose sound system for music, large TV's and great kitchen for cooking family meals. At the end of a long day at the beach, we looked forward to relaxing on the comfy patio furniture. Thanks, Susan & Rick. We love your house.